Dirty dangles but such clean hands… beautiful. 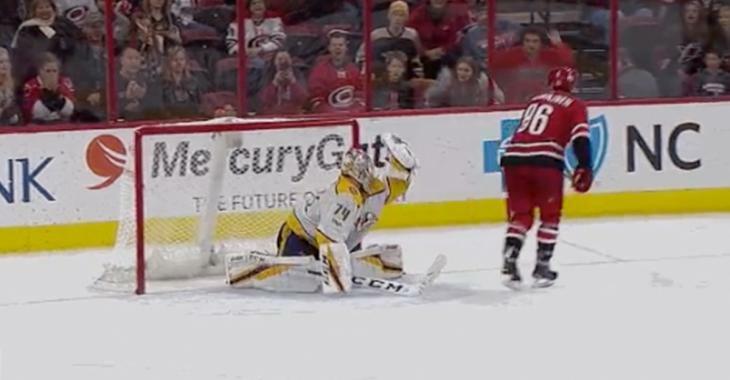 The Carolina Hurricanes have been one of the most disappointing teams in the NHL so far this season. With a a 10-8-4 record through 22 games, the Canes are just two points up on the Philadelphia Flyers in the basement of the Metropolitan Division, despite being a trendy offseason pick to return to the playoffs. With so much ground to make up at this point though, it could be tough for the Canes to get back into the race. Thankfully though, at least one player is coming through as a clutch performer for the team this season. After breaking out for 15 goals and 42 points last season, 23-year-old Teuvo Teravainen has exploded offensively this season with eight goals and 21 points in just 22 games. Tonight, the Helsinki native showed off some of his nicest moves to date, earning the shootout winner over the Nashville Predators. Pretty, pretty smooth. Hopefully Teravainen can produce more highlight reel moves like this as his team attempts to climb the standings. Linemates Sebastien Aho and Justin Williams have produced as well this season, but depth players like Jordan Staal, Jeff Snikker and Elias Lindholm will need to pick up the pace from here on out.